Awarded for collecting 5,000 gold, "you gots ta gets paid"
Awarded for collecting 25,000 gold, "you got bank"
Awarded for collecting 100,000 gold, "make it rain"
Awarded for collecting 500,000 gold, "perhaps you should purchase a monocle"
Awarded for killing 1,000 Monsters, "just getting warmed up"
Awarded for killing 5,000 Monsters, "KILL FRENZY"
Awarded for killing 10,000 Monsters, "How do sleep at night"
Awarded for pwning the "Giant slug"
Awarded for pwning the "Emerald Crusher"
Awarded for pwning "Twinkle Toes"
Awarded for pwning the "Rainbow Pig"
Awarded for collecting 100 power ups "With great powers comes great responsibility"
Awarded for shooting 50,000 bullets "Increasing your carbon footprint one cartridge at a time"
Awarded for collecting 100 guns "Lock and load"
Awarded for killing 2,000 slimes "Slime hatred"
Awarded for reaching the "Twisted Tundra"
Awarded for reaching the "Arid Dunes"
Awarded for completing 10 jobs for Modellos, "Working hard or hardly working"
Awarded for completing all jobs for Modellos, "Work hard, play harder"
Awarded for killing one of every Monster, "All must fall"
Awarded for visiting every location on the map "Been there, done that"
Awarded for collecting all Sweezy Coins "Bling Bling"
Awarded for collecting one of every Monster Card "Stacking the deck"
Awarded for completing 25% of Sweezy Gunner "Baby Steps"
Awarded for completing 50% of Sweezy Gunner "Half way there"
Awarded for completing 75% of Sweezy Gunner "So close you can taste it"
Awarded for completing 100% of Sweezy Gunner "Thank you for loving Sweezy Gunner :D"
Awarded for completing 7 Sweezy Challenges "You got skills!" Awarded for completing 14 Sweezy Challenges "Remember to blink!" Awarded for completing 21 Sweezy Challenges "You like the taste of mayhem!" 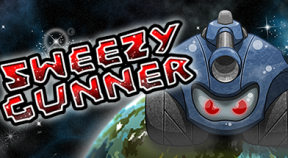 Awarded for completing 28 Sweezy Challenges "You are a Sweezy Gunner legend!"